November 30, 2013, 10:07 a.m.
With Christmas just three and a half weeks away – the city centre lights are up and the the major high street brands rolling out their festive adverts – the build up to Christmas is in full swing. The hype leading up to Christmas seemingly gets earlier each year, creating excitement for some but animosity for others. One head teacher even went as far as banning children talking about Christmas until December. YouGov research shows that in general Brits are still positive about Christmas, but some would do away with it altogether. 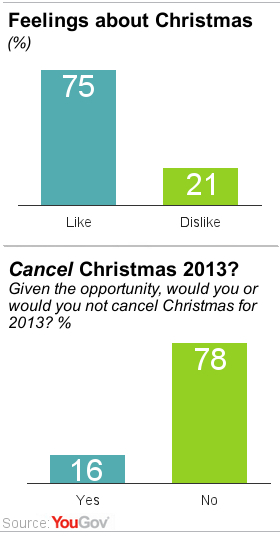 Overall one in five (21%) of the public confess to not liking Christmas compared to 75% that do. Women are generally more positive about Christmas than men; one in four (26%) British men confesses to not liking Christmas compared to just 17% of women. There is also a strong tendency for older people to dislike Christmas: 27% of over 60s don’t like Christmas compared to just 13% of 18-24 year olds. Amongst voters of the four main political parties, UKIP voters (32%) are more likely to dislike Christmas than the voters of the other parties and Conservative voters the least (19%). However, around one in six (16%) British people would go even further and cancel Christmas 2013 altogether given the opportunity. Perhaps unsurprisingly, there people who subscribe to no religion are particularly likely to dislike Christmas (29%) or to want to cancel the holiday (24%). However the differences between this group and the largest Christian group in Britain – Anglicans – are not huge. And the proportions of Anglicans who dislike Christmas (20%) or would cancel it (14%) are not very far off from the corresponding proportions for the general population. Also, the Britain appears to be a relatively Christmas-friendly place when compared to some of the European nations surveyed in YouGov&apos;s monthly EuroTrack poll. 58% of British adults are &apos;looking forward to&apos; Christmas this year, compared to 56% of Swedes, half (50%) of Germans, 43% of Finns and just a 25% quarter of French people. British people are also among the most likely to say that Christmas is their favourite public holiday, as half (50%) do. Germans (35%) and the French (19%) are the least likely of the seven nations to call Christmas their favourite holiday.